San Beda, DLSU In Finals | Servinio's Sports Etc. 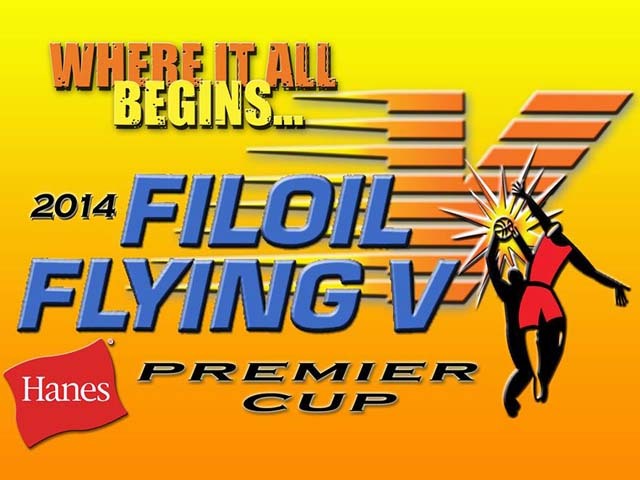 SAN JUAN City – It will be a titanic clash of league champions as the San Beda College Red Lions and De La Salle University Green Archers booked a one-game titular showdown for the 2014 FilOil Flying V Hanes Premier Cup in contrasting fashions Friday afternoon (June 6) at the San Juan Arena. The trophy will be disputed on June 8 (Sunday) at the same venue starting at 4:00 PM. The Red Lions survived a big scare from neighbor Centro Escolar University Scorpions, 63-62. On the other hand, the Green Archers capitalized on the big endgame meltdown of the Southwestern University Cobras to prevail, 72-64. Very much in control since the opening tip and ahead by as much as 10 markers in the third period, 44-34, the Red Lions allowed the Scorpions to slowly chip away at their lead until Rodrigue Ebondo forced the game’s lone deadlock at 58-58, and 5:32 to go in the final canto. A Ryusei Koga triple and an Art dela Cruz basket against a Karlo Casino field goal kept the Red Lions on top entering crunch time, 63-60. Alfred Batino then scored underneath to threaten with 1:21 on the clock, 62-63. The Scorpions then had a golden chance to steal the game after San Beda committed a 24-second violation. Given eight seconds to execute, Casino received the ball only to slip just outside their free throw circle and had no recourse but to launch an awkward attempt that went nowhere. Batino tried to tap in the offensive rebound but it also missed as the final buzzer sounded. “I instructed the players not to switch on defense and go for one-on-one defense,” said Coach Boyet Fernandez. The loss thus ended the Scorpions’ seven-game winning streak since the tournament began last April 23. Ola Adeogun led San Beda with 16 points, 13 rebounds and four blocks. Dela Cruz followed with 15 points, eight rebounds and five assists. Samboy de Leon knocked in three triples en route to pacing the Scorpions with 16 markers. Batino had a double-double with 12 points and 10 rebounds. Falling behind by four at halftime, 35-39, the Green Archers of Coach Juno Sauler banked on a 15-7 blitz with Almond Vosotros hitting the go-ahead shot and capped by a Thomas Torres triple for a 52-48 count. The defense also held the Cobras sans a field goal for the final four minutes of the third period. The Cobras then began to fire blanks with only Mark Tallo finding the basket with a pair of triples. Arnold Van Opstal and Jeron Teng then submitted back-to-back field goals that gave the Green Archers their biggest lead of the game with 3:23 to play, 70-59. Southwestern actually erected an early 5-0 lead, but this was quickly neutralized by a 13-0 run behind the six markers of Teng, 13-5. The Cobras had their best moments in the second period as Antonio Pardo and Jasper Parker rained five triples on the Green Archers to seize back the lead, the last one coming at the buzzer courtesy of Parker to settle the halftime score. The Green Archers thus asserted their mastery of Southwestern whom they defeated last May 24 in Lapu-Lapu City, 64-59. Poor shooting tolled heavily on the Cobras as they went 23 out of 69 for a 33% clip compared to DLSU’s 32 out of 61 (52%). Vosotros scattered 17 points to pace the Green Archers on top of five rebounds and three assists. Teng followed with 14, 10 coming in the first half. Parker topped the Cobras with 17 points, six rebounds and five assists but was limited to only four markers in the second half. Tallo added 14, all coming in the second half. Meanwhile, the CEU Lady Scorpions of Coach Jay Cambarihan delivered some positive news for their school as they salvaged Third Place in the Women’s Division by whipping the University of the Philippines Lady Fighting Maroons, 57-51. The feat marks an improvement from their Fourth Place finish in their maiden appearance last year. After UP’s Bea Daez put her side ahead for the last time with three minutes remaining, 50-48, the Lady Scorpions unleashed a dizzying 9-1 windup. Janine Pontejos delivered the crucial blows, capped by the insurance free throws that fixed the final tally with 17 seconds to go. Pontejos top scored for the Lady Scorpions with 16 points. Folashade Ogunsemoyin and Mary Ann Doloque followed with 11 each with Ogunsemoyin hauling 16 rebounds. Maan Wong came off the bench to lead the Lady Maroons with 20 points and 12 rebounds, hitting the lone free throw in the final three minutes. Daez was next with 11 points. In the Junior Division’s Third Place playoff, the Ateneo de Manila University Blue Eaglets snuffed the La Salle Green Hills Greenies in overtime, 108-105. Regulation play ended at 96-96 on the strength of two free throws by Blue Eaglet Mike Nieto with 31 ticks on the clock. In the overtime, Ateneo leaned on the superb play of Jolo Mendoza whose free throw split tied the game for the last time at 101-101 and then hit a big triple for a 106-101 edge with 45 seconds to go. While the Greenies managed to threaten, defense saved the day as the Eaglets blocked Dino San Juan’s triple attempt at the buzzer. Mendoza finished with 36 points followed by Matt Nieto with 22 points, six rebounds and seven assists for the Blue Eaglets of Coach Joe Silva. Ricci Rivero led LSGH with 22 points and 13 rebounds followed by Michael dela Cruz with 19 points. CENTRO ESCOLAR (57) – Pontejos 16, Ogunsemoyin 11, Doloque 11, Caranto 6, Figuracion 4, Lacson 3, Tejada 3, Mercado 3, Manzano 0, Mamaril 0. UP-DILIMAN (51) – Wong 20, Daez 11, Tatel 10, Isip 5, Pesquerra 2, Bautista 2, Aliermo 1, Esplana 0, Lapid 0, Aurellado 0, Medina 0. Period Scores: 15-9, 25-24, 39-39, 57-51. DE LA SALLE (72) – Vosotros 19, Teng 14, N. Torres 12, Van Opstal 11, Perkins 5, Andrada 4, T. Torres 3, Sargent 2, Rivero 2, Montalbo 0, Mustre 0, Bolick 0. SOUTHWESTERN (64) – Parker 17, Tallo 14, Pardo 9, Mohammed 8, Sanjo 4, Goloran 4, Luz 4, Bregondo 4, Aboude 0, Acuno 0. Period Scores: 24-16, 35-39, 56-51, 72-64. SAN BEDA (63) – Adeogun 16, dela Cruz 15, Amer 8, Pascual 6, Koga 6, Mendoza 6, A. Semerad 4, Cabanag 2, Ludovice 0, Tongco 0, Mocon 0, D. Semerad 0. CENTRO ESCOLAR (62) – de Leon 16, Batino 12, Jeruta 8, Abundo 7, Casino 5, Mutombo 5, Ebondo 4, Opiso 3, Sedurifa 2. Period Scores: 19-12, 37-29, 54-46, 63-62. This entry was posted in Basketball, NAASCU, NCAA, Sports, UAAP. Bookmark the permalink.